Does your tot’s cup always seem to runneth over ever since you made the switch from sippy to big kid drinkware? 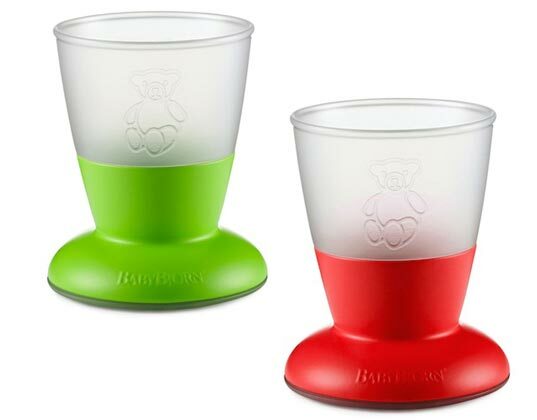 BABYBJÖRN’s new baby cup will help make the tricky transition less of a mess. Geared toward babies ages 8 months and older, the cup is ergonomically designed for pint-sized grasps, featuring easy to grip materials and a soft rounded rim to protect baby’s pucker. A rubber strip on the cup’s bottom, and a low center of gravity make this inaugural frosted glass chalice sturdy, steady and hard to knock over. Additionally, it is free of PVC, phthalates, cadmium, lead, bromine and chlorine, and it is dishwasher and microwave safe. Does your tot's cup always seem to runneth over ever since you made the switch from sippy to big kid drinkware? BABYBJ�RN's new baby cup will help make the tricky transition less of a mess. Geared toward babies ages 8 months and older, the cup is ergonomically designed for pint-sized grasps, featuring easy to grip materials and a soft rounded rim to protect baby's pucker. A rubber strip on the cup's bottom, and a low center of gravity make this inaugural frosted glass chalice sturdy, steady and hard to knock over. Additionally, it is free of PVC, phthalates, cadmium, lead, bromine and chlorine, and it is dishwasher and microwave safe.